With an increasing public awareness that the PacNW is due for large seismic events (earthquakes), we thought we would share this post for a residential seismic upgrade. Upon recently moving into an older home in west hills a client of our become very nervous about the height of the house on its slope and its existing foundation. We meet with them at the home to review and discuss options. The home is a 1940’s house built on a 1900’s brick foundation, all built onto a steep sloping lot. The main portion of the work would focused on upgrades to the foundation, crawl space and daylight basement. Since they were not planning to do an addition or major renovations at this point it was determined the best appraoch would be a voluntary seismic upgrades as repair work. From there we developed a design, engineering and budgeting package and assisted them in finding and choosing a general contractor to do the seismic work. 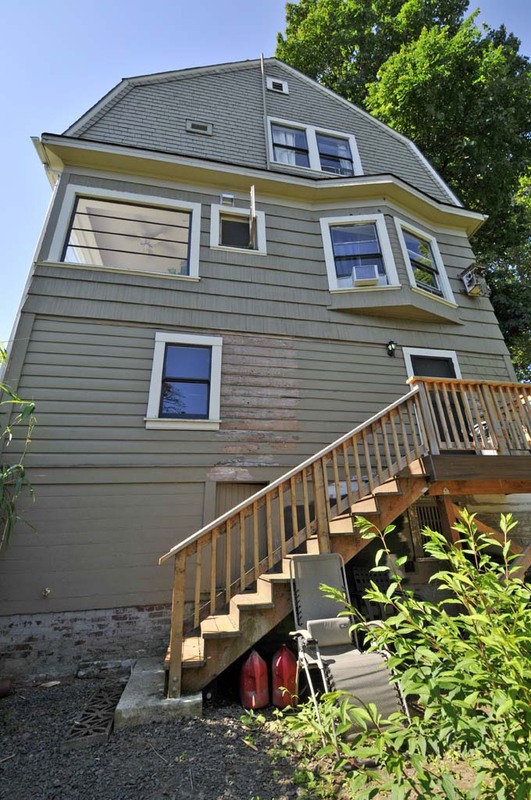 3 stories plus a crawl space on brick foundation and slope lot. The daylight basement’s (top of exterior stair) interior finish was demo’ed and then fully sheathed w/plywood, nailed per engineering and through bolted to the crawl space walls below and main floor walls above. New foundation at inside of brick and new plywood shear walls connected to new foundation and through bolted to daylight basement walls above. New foundations were excavated and poured behind the existing brick foundation. New pier footings were poured at interior post supports. All interior support posts were connected to beams above and floor/beams below.